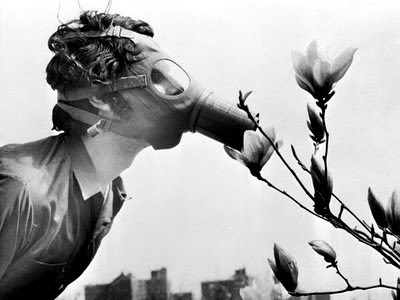 On April 22, 1970, the first Earth Day, a college student sniffs a magnolia blossom through a gas mask in New York City. Such street theater--along with teach-ins, rallies, and other events promoting environmental awareness--drew an estimated 20 million people. Corky Parker, now director of sustainability for drugstore.com in Seattle, was a teenager when she attended a 1970 Earth Day event in New York. She jokes that she was "more excited about wearing a yellow crocheted miniskirt" her mother had made for the event than any consciousness raising. But, Parker said, she ended up majoring in environmental economics in college and credits the 1970s environmental movement with awakening the country. "Now it's called sustainability, or green, [but] it's still the same thing," Parker said via email. "Finally the masses are getting it. Now we know 'being ecological' is not separate from business, or health, or community. But it is a part of everything we do."